It's not petit four which I will present you for the SHF # 24 but they are little bites of delight, too! 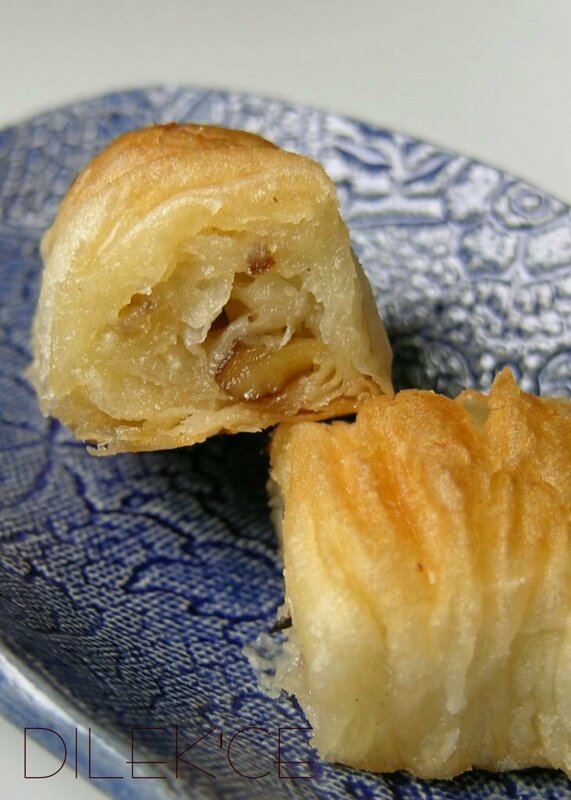 Sari burma (~golden twist) is a sort of baklava from Turkey. I promised Zorra from Kochtopf last year that I will take pics how its prepared at home. So nearly one year later last saturday my mother in Germany prepared sari burmas for the Ramadan feast (Eid ul-Fitr). I took the pics and my son helped her;) ! On the side to near you(long side) strew from the chopped walnut sugar mixture in a line. 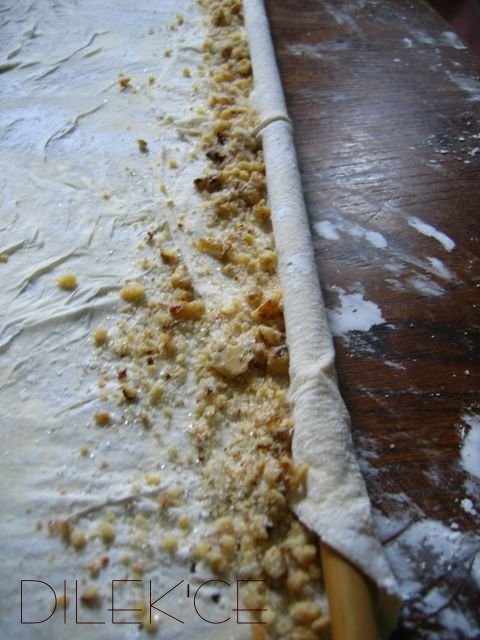 With the very thin (special) rolling pin roll the sheet in a very tight roll. The end of your shett should be straight (cutten or layed). Pinch the roll from both edges. Pull the sheet carefully from the rolling pin. Set it on the baking tray. When your tray is filled you cut your rolls into smaller pieces with a sharp knife. Heat up the butter and the oil together. Sprinkle the rolls with the warm oil. Bake it till it is golden brown at180-200°C. Meanwhile boil sugar, water, and lemon juice. This boils for about 20 minutes till gets syrupy. Cool it and pour it on the sari burmas after baking. Either your syrup or your baklava must be cool! The measures for the ingredients will be writen soon. My mother unfortunately has no exact measures. She has a feeling for it. 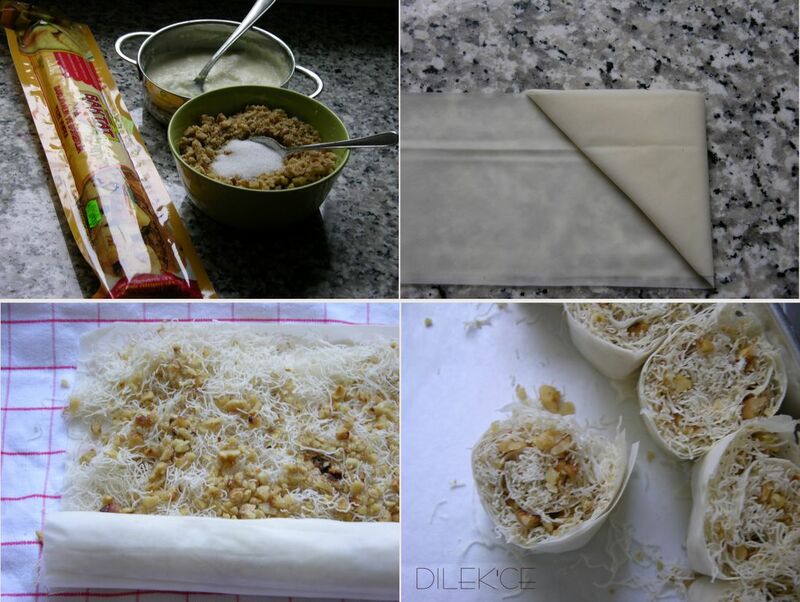 Last month I used phyllo pastry sheets which I don't like really. I baked the muska tatlisi and söbiyet (other sorts of baklavas) as you see below. Söbiyet is the big 10 sheets layered triangle with a creamy filling. Muska tatlisi are the closed small triangle with chopped nuts or pistachios. They are normally fried in oil before they are candied in sugar or honey syrup. 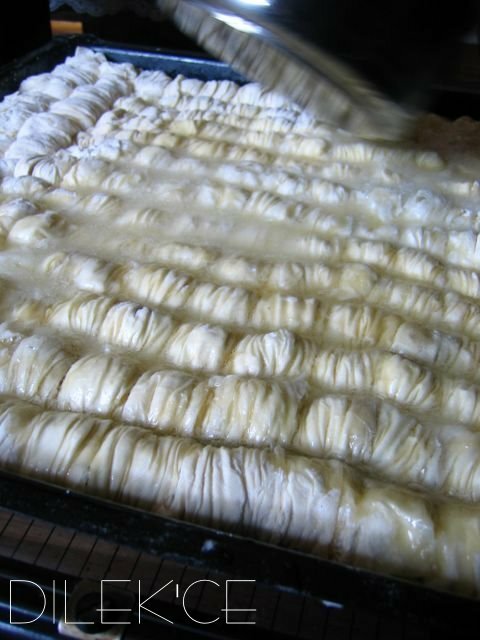 By using phyllo pastry sheets you can bake many of the sweeties from the turkish kitchen. 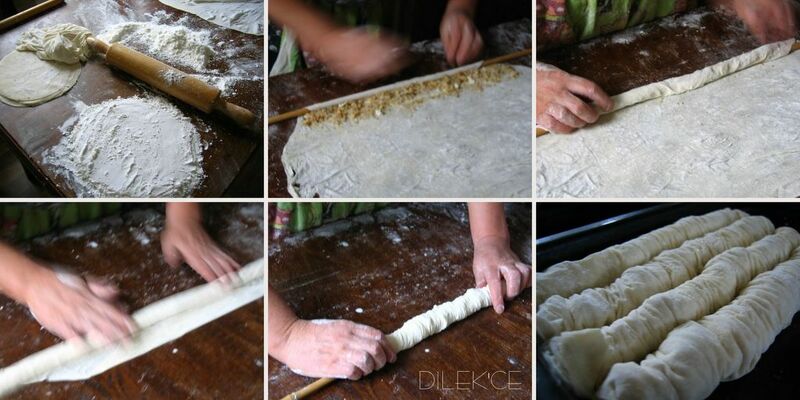 If you fill the phyllo pastry sheet with kadaif, roll it and cut it into 2cm pieces. So you have the yufkali kadaif tatlisi for example. So the bites of delight are endless in the turkish desserts with syrup. Eat only a few bites otherwise a sugar shock is inevitable. 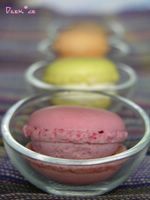 Looks delicious - plus you seem to get a lot of these 'little twists' when you're done! I hope you can post the recipe soon! Wow - that's really impressive! I love the photo illustrations showing how they are made (it looks like hard work!). 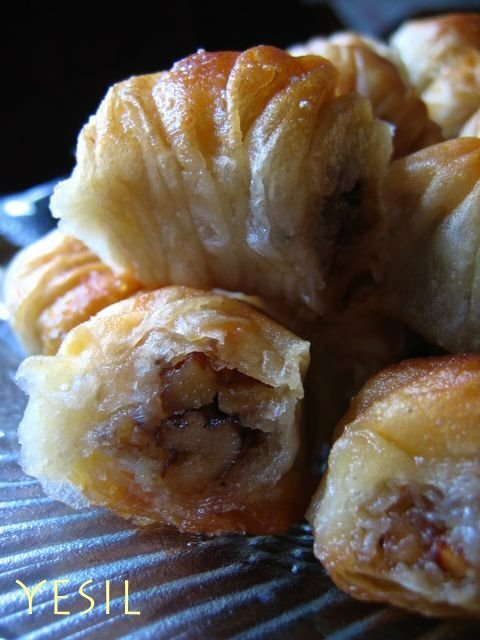 I love baklavas, so I suspect I would like these too :-) Thanks for contributing to SHF. Besides, I love baklava ^^. Your mother and your made a great work ^^. I bow before your mom and you, anyone who can make these earns respect. But I have to correct one thing: These are called sarigi (with yumusak g) burma, not sari burma. Meaning sarik, the turban. I am from Antep and can't stand it if I see a mistake like this.... Sorry! Hi Surfindaave, i will write for you the recipe soon. I thought the recipe maybe interest nobody:)Yes there are many little twists. Jeanne thank you for your theme and hard work about the roundup too! Handecigim, malum ingilizcem kötü onun icin türkce devam ediyorum. Bu isim konusu sanirim türk mutfaginin büyük problemlerinden. Ayni sey icin onlarca isim kullanilirken farkli seyler icinde ayni ismin kullanildigini görmek mümkün. Sebebleri yöresel farklilar disinda tabi ki bazi mercilerin kendini yarim bilgileri ile uzman ilan etmelerindende. Bircok tarif orjinalinden uzaklasirken hala ayni ismi tasiyabiliyor. Tavugun bile bonfilesi olduktan sonra Türkiye'de;) Benim senin sarigi burmana sari burma demisim olaya bu acidan bakinca pek yanlismis gibi gelmiyor;)Kalmis ki zaten ben koymadim ismini. Insallah alinmamissindir, tariflerin hep cok güzel ve ben zevkle izliyorum. Cok da zor seyler yapiyorsun, hic benim kalkisamadigim seyler valla. Lutfen devam! Oh my god, these look scrumptious also. And so nice when the intermediate steps are pictured. I have seen similar recipes but your Mom's results looks a lot more professional. Looking at the final product, I would have sworn these were store bought. Great job. Will be looking forward to the recipe.